The original 300 movie was quite the visual treat at the time. It already had a pretty solid story given the Frank Miller source material and at the time Zack Synder's unique visual treatment at the time was pretty refreshing and it certainly did a lot for the movie. Forgetting the fact that the "300 style" has been copied time and time again much to the detriment of the movie experience as a whole, it certainly had its place in the world. So I was pretty surprised when they announced that there would be a sequel to that movie, this being 300: Rise of an Empire. Given it had been about seven years since the last movie, I'm not sure where the desire to create this movie came from. I mean seriously, the last movie I remember really trying to capitalize on this movie style was Immortals, and that was a rather painful movie experience. And while this movie has some claims to being based on unreleased Frank Miller source material, it's hard to fully appreciate the direction the folks took with this movie. The first movie was brilliant partly because of how well it managed to recreate the visual style of the original comic. This time around folks didn't exactly have a reference point, and so we can only trust the vision of the director in terms of how this movie was presented. 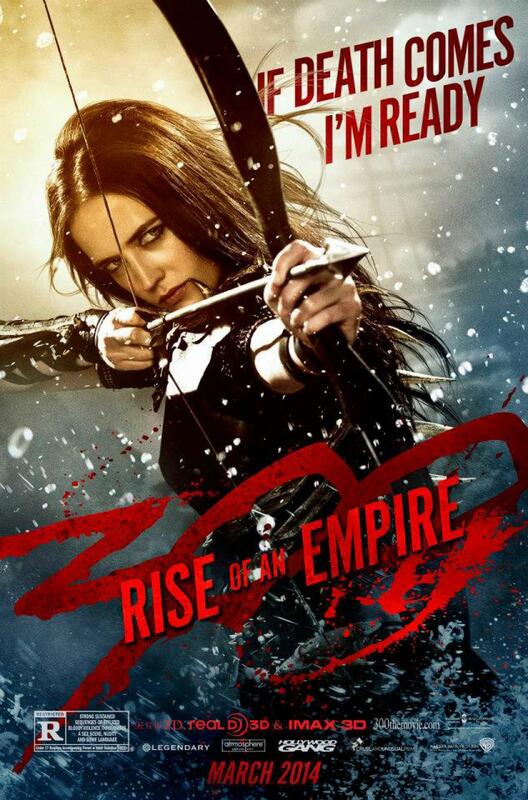 Synopsis: 300: Rise of an Empire is a 2014 sequel to the 2007 movie 300. This time around the movie was directed by Noam Murro, although Zack Snyder still contributed to the screenplay together with Kurt Johnstad. The story is somewhat based on the unreleased Frank Miller comic, Xerxes. The movie starts a short time after the events of the first movie, with the forces led by King Leonidas having fallen to Xerxes (Rodrigo Santoro) and his forces. Back in Sparta, Queen Gorgo (Lena Headey) rallies her men and tells them the tale of King Darius of Persia (Yigal Naor) and how he had been killed by the Greek general Themistocles (Sullivan Stapleton) at the Battle of Marathon. Xerxes had been present at the battle as a young boy and had witnessed his father's death. His father's last words told him to give up the campaign against the Greeks given only the gods could defeat them. But Darius' naval commander, Artemisia (Eva Green) takes these words as a challenge and tells the young Xerxes that he must instead become a god to face the Greeks again. He goes into the desert and finds a cave that gives him the blessing of power that he had sought out. Now believed to be a god-king, Xerxes leads the Persians back to fight the Greeks. Themistocles gathers his council to plan their defense and he petitions for a fleet that he can take to face the Persians at sea. He also seeks the help of the Spartans, but Queen Gorgo is wary about siding with Athens just yet. In essence, the movie is set as a sort of prequel that becomes a story that happens pretty much simultaneously as the first movie. Given the fact that it is a story being told to the Spartans by their Queen, this even includes Themistocles learning that King Leonidas and his forces have headed off to the Hot Gates to dry and delay the Persian advance. It's a little weird, but on the whole it all works out decent enough. Eva Green is obviously the star of this movie. It's hard to tell one Greek warrior from another apart maybe from the color of their capes, but Eva Green is Eva Green is Eva Green. You should already be familiar with her striking on-screen presence from Penny Dreadful and she is perhaps the only thing that makes this movie halfway bearable. She's quite the powerful force in this movie - both as a warrior and as a political manipulator. Everyone is was sadly bland and there's just a lot of your usual posturing going around. The only rule in terms of casting and how the shots were dressed up appears to be how no one can be quite as ripped and defined as the Spartans. The Greeks from the other city states aren't exactly fat or anything, but then the art direction really seemed to made sure that the Spartans glistened the most. Considering you only really get to see the Spartans at the beginning and the end of this movie, that can be a little disappointing to some. The first movie gave the Persians a lot more character compared to this one. In that first movie, we were introduced to the various elements of the army like the magicians and the Immortals and such. But this time around we didn't really have any of that and instead scenes just consisted of the two sides clashing with one another in the now-classic slow motion fighting that we've seen in almost every movie after 300. Things were certainly bloody enough, but it didn't necessarily feel tasteful by design or anything like that. On the whole the movie felt rather shallow with a flimsy plot and just about any excuse to launch into a slow motion fight sequence. There were the occasional interesting fights to be certain, but we also got a lot of CGI warriors and horses jumping from ship to ship and other embellishments that just cheapened the whole experience. And the general Themistocles as portrayed by Sullivan Stapleton just wasn't quite as charismatic a leader that Leonidas had been on-screen. 300: Rise of an Empire is a movie sequel that no one really asked for and thus didn't really have a clear voice of its own. All the same elements from the first movie were there in terms of overall treatment, but it was a movie without heart. Thus I can only really rate it as 2 Greek ships ramming into their enemies out of a possible 5, and that's almost entirely because of Eva Green's performance alone.